Human powered ornithopters- Biomechanics at its best! It is no surprise that humanity’s first attempts at human powered flight were based on birdlike structures. 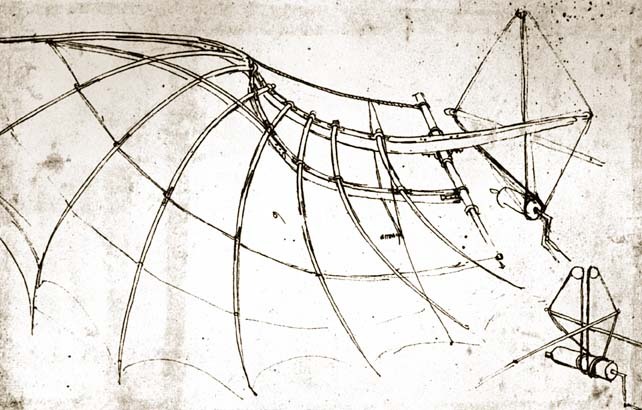 The first proposed reasonable flying device was proposed by the prodigious artist and engineer Leonardo Da Vinci in 1490 and consisted of a giant bat-looking aircraft that used the pilot’s arms and legs to power the wings. However, “human-powered wing-falpping flight” is such a complex concept, that engineers have not yet been able to completely master it. The extraordinary Snowbird, constructed from carbon fiber and balsa wood, weighs just 94 pounds and has a wingspan of 104 feet. 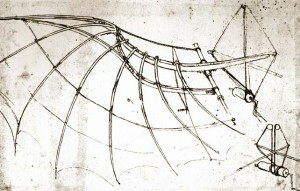 Unlike planes, the ornithopter’s wings must generate both lift, to overcome the weight of the aircraft, and thrust, to counteract the body drag. Lift is produced the conventional way, by deflecting air downwards. Yet, thrust generation poses a greater challenge because these machines must be able to produce enough thrust to keep the device at the required forward velocity.This thrust is produced by placing the wing at a lower angle of attack on the upstroke and at a higher angle of attack on the downstroke. As we can see in the figure below, this results in large amount of lift and thrust on the downstroke and significantly smaller amount on the upstroke. Throughout the stroke the wing must twist and shift to maintain an ideal angle of attack. Achieving the right twist along the entirety of the span is one of the more difficult problems in building a successful ornithopter and has formed the basis of much of the past research at the University of Toronto. In the simple words of the creator “It works by pumping a set of pedals attached to pulleys and lines that make the wings flap,” Reichert says. When the pilot pushes the pedals, the go down, and aerodynamic forces pull them back up, creating the thrust. Chronister, Nathan. “The Ornithopter Zone – Fly Like A Bird – Flapping Wing Flight.” The Ornithopter Zone – Fly Like A Bird – Flapping Wing Flight. Nathan Chronister, n.d. Web. 26 Sept. 2012. .
“A Brief History of Human Powered Aviation and Ornithopters.” HPO Team News. N.p., n.d. Web. 26 Sept. 2012. .
Johnson, Caleb. “First Human-Powered Ornithopter Flight Recorded by Canadian.”Switched. N.p., 23 Sept. 2010. Web. 26 Sept. 2012. “Technical Info.” HPO Team News. N.p., n.d. Web. 26 Sept. 2012. .
“HPO Team News.” HPO Team News. N.p., n.d. Web. 26 Sept. 2012. You forgot to tell us how recent this is! In any case, they flew less than 20 seconds, so it looks like this concept has a long way to go.